Sporty’s was founded by a pilot over 55 years ago, and from the beginning our company has been for pilots and by pilots. Our broad experience and passion for aviation makes us uniquely qualified to offer only the finest, most unique aviation products. Before we sell a new product, every one is rigorously tested by our team of pilots in the real world of general aviation airplanes. They use products just like you would (and that means no instruction manuals!). If our panel doesn’t think a product is useful, easy-to-use and reliable, we simply won’t sell it. 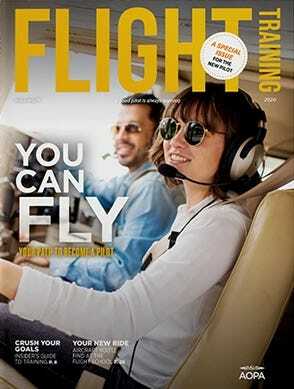 The online Learn To Fly Private Pilot Course is the product I’m most proud of. All 3 formats are great but the online format is able to be updated by Sporty’s Academy in real time with new HD video and more in-depth aviation videos as soon as they’re available. It’s the way to go. As Sporty’s top video producer, Bret is usually flying an interesting airplane, and often with a camera rolling. "I enjoy a mix of both professional and recreational flying at Sporty’s. When instructing, I specialize in Technically Advanced Aircraft, and help pilots make the most WAAS approaches. And for fun I love taking Sporty’s 1963 Aztec out." Bret is also known as "Mr. iPad" at Sporty’s, and is the lead tester for the latest apps and accessories for mobile devices. "My license says English Proficient, but my Senior English teacher, Lynda McKee, might take exception to that." Charlie learned to fly in college, and has been an avid pilot ever since. 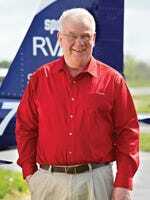 He has visited every public-use airport in most of Ohio, Kentucky and West Virginia, "including the expansive 12,000 ft runways of Columbus Rickenbacker (KLCK) and the 24 ft. wide, dogleg right, one way in/same way out, Mallory Airport (WV12) in Charleston." Charlie manages the customer experience and sales for Sporty's Academy & Eastern Cincinnati Aviation, but his most memorable flight was in a rented Skyhawk over the active Kilauea Volcano in Hawaii. The Captain's Flight Gear Bag is my go-to-bag when heading out for a day or two. When I fly to Sun 'N Fun or Oshkosh the Captain's bag hold everything I need for flying plus two changes of clothes. It's a great overnight bag. Having a childhood dream of aviation, Chris first became an Aviation Explorer, which motivated him to earn his private pilot's license as a teenager. During his four years at Embry Riddle Aeronautical University he earned his commercial, multi-engine certificate with an instrument rating. 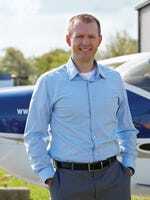 While experimenting in seaplanes, gliders, and a variety of other personal aircraft, Chris developed a passion for general aviation and shares that passion as he develops aviation training apps and content for Sporty’s Pilot Shop. He's also an experienced drone pilot. Chuck holds the record at Sporty’s for fastest flight training program—he earned his Recreational Certificate in just two weeks. He later added a Private Certificate, plus Multi-engine and Instrument ratings. Today, he enjoys recreational flying more than anything, "whether it’s a morning flight for breakfast at a nearby airport or a trip with the family." 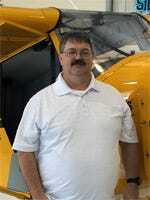 Chuck is the airport manager for I69 and is also the President of Cincinnati Avionics, Sporty’s on-site avionics shop. His expertise in aviation electronics is invaluable in developing and testing new products, from portable radios to ADS-B Out transponders. Eric has always been interested in flying, and his father paid to have he and his brother go up in a Cessna. He started with control line aircraft and then progressed to building and flying radio controlled aircraft. After retiring from the Navy he decided that it was time to learn to fly real aircraft. His only regret is that he did not learn sooner. The real pleasure of flying for Eric is flying Young Eagles for the EAA's Young Eagles program. Nothing gives him more satisfaction than taking a young person up for their first GA flight. Now he feels lucky to work at Sporty's. It was his first airplane trip at age seven that made Eric decide to become a pilot. "While boarding the airplane, a flight attendant noticed my interest in the flight deck and urged me to go talk to the pilot. I give a lot of credit to that pilot for my career choice." 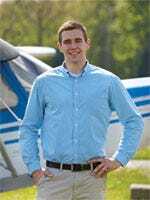 He learned to fly at Sporty’s as part of the University of Cincinnati’s Professional Pilot Program, an initiative he now directs. He earned a bachelor’s degree in finance and went on to an airline career. 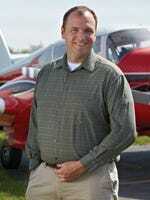 Eric now heads Sporty’s flight school and directs the University of Cincinnati’s Professional Pilot Training Program. In addition, Eric serves as a Captain in Sporty’s corporate flight department. Since our very first product was an aviation radio, I’m partial to our SP-400 Hand-held NAV/COM. It’s an amazingly powerful radio, and one I never could have dreamed of in 1961. 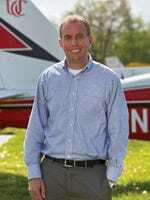 J.C. learned to fly at Sporty’s Academy after graduating from the University of Cincinnati, Lindner College of Business. His father is an ATP and A&P/IA, so he's been flying in and working on airplanes with his dad since he was old enough to hand him a wrench. J.C. has worked at Sporty’s for over 5 years and says he loves every minute of it. Currently he develops the weekly emails you may get from Sporty’s and finds new products for pilots that help making flying easier and even more fun. When I was training for my first pilot's license the electronic E6B saved me time flight planning. But most importantly, it made my calculations on the written test faster and easier. I wouldn't want to take an exam without one. 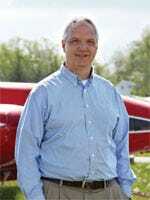 Mark Wiesenhahn is a vice president at Sporty’s, where he has worked for the past 25 years. 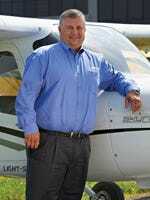 In addition to his administrative duties managing Sporty’s dealers and vendors and directing media relations and trade show participation, Mark works closely with Sporty’s partnerships within the industry including AOPA and EAA. 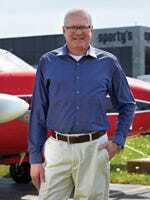 He is actively involved in promoting Aviation Exploring and has been an Exploring advisor for 20 years. 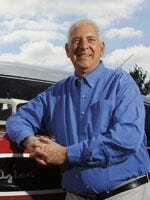 He serves on the Executive Committee of Learning for Life Organization as the Exploring Chair. Mark is a recreational pilot. I fly multiple aircraft regularly. Having an accurate CO detector in my flight bag is great insurance. I love that this has a digital readout in ppm, light, noise and vibrating alarms to grab my attention in an emergency. 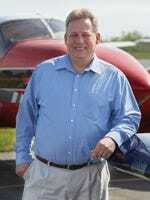 Paul is a true aviation educator, and one of only a handful of flight instructors in the world to have earned both the Master Flight Instructor and Master Ground Instructor certifications. 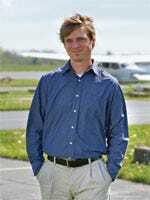 “I really enjoy teaching, especially in the Aztec.” Paul also teaches several classes at the University of Cincinnati’s Professional Pilot program, including weather theory. 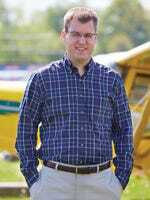 When he’s not teaching, you’ll find Paul flying an Aztec or a Cessna 182 for personal transportation.